Murali Vijay and Cheteshwar Pujara put on an unbeaten 107-run partnership for the second wicket as India ended the second day of the fourth Test in Mumbai at 146/1. Earlier, Ravichandran Ashwin completed a six-wicket haul to bowl out England for 400, after some late resistance from Jos Buttler. India got off to a perfect start with R Ashwin sending Ben Stokes packing in his second over of the day. The dismissal came under controversial circumstances as India reviewed the decision that was initially given not out and the Ultra Edge feature on the DRS proved to be inconclusive. However, the third umpire gave away the decision in India's favor and Stokes had to make his way back to the pavilion. Chris Woakes came to the crease and laboured on while Jos Butler managed to put away a few bad deliveries. Shortly after England crossed the 300-run mark, Woakes' resistance finally came to an end when he just grazed a brilliant Jadeja ball on its way to the keeper. Adil Rashid was the next to depart as Buttler found himself running out of partners and started to up the run-rate by scoring a boundary in every over to get to his fifty. He set up a good partnership with Jake Ball for the ninth wicket as the duo took the score past 350. As the teams broke for lunch, England were the happier side with a score of 385/8 and Buttler still at the crease with 64 runs. However, Jake Ball’s late fightback came to an end, in the 128th over as Ashwin found his edge with a ball that turned and bounced. Buttler did not remain for long after that as he went in search of more boundaries. Batting at 76, Buttler charged down the track to Jadeja and missed the ball completely with a wild swing of his bat. The ball rattled the stumps and brought down the curtain on the England innings at 400. KL Rahul, who returned to the team after his injury lay-off, made a positive start to his innings at the top of the order. His punch through the covers to hit Anderson for a boundary in the seventh over showed he was ready for a strong comeback. However, it was aggressiveness which led to his downfall a few overs later. Moeen Ali flighted a delivery outside the off-stump inviting a drive against the spin from Rahul through the vacant cover region. The Indian batsman obliged, but the ball went through the gap between his bat and pad and crashed into his stumps. India were down to 39/1 in the 14th over. 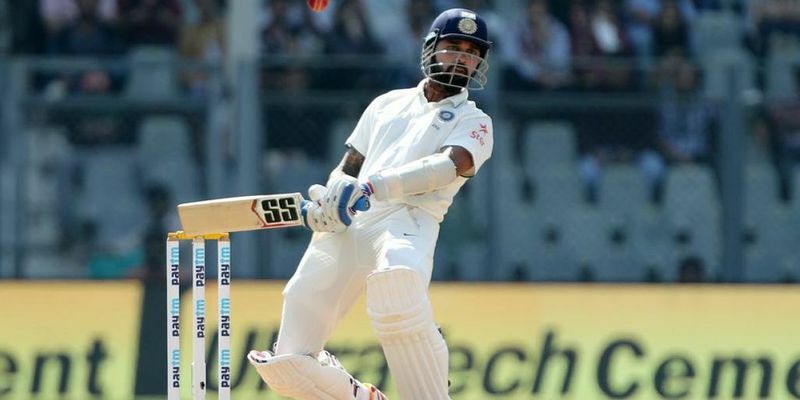 After that initial hiccup, Murali Vijay and Cheteshwar Pujara steadied the ship and formed a crucial partnership. Vijay, who was cautious early on in his innings, slowly began to grow in confidence. He took on Adil Rashid in the 17th over and hit him for a four and a massive six down the ground. Pujara was his usual assured self at the other end, and the duo safely took India to tea at 62/1. In the final session, Vijay was lucky to survive a stumping chance in the 32nd over when he was beaten all ends up by a googly from Rashid. However, he kept going and brought up his half-century a few overs later with deft dab down to the thirdman. At the other end, Pujara held his fort and ended the day three runs short of another half-century. The duo's 107-run partnership remained unbroken as India ended the day at 146/1, and are in a strong position to overtake England's first innings total.